Archives : MID-CAPS CORRECT - 11/01/2013. MID – CAPS CORRECT – 11/01/2013. Infosys rallied around 17% on Friday on the back of strong quarterly results and an upping of revenue guidance. Even though the Sensex and Nifty showed minor losses for the day, the ground reality was totally different. The overall market was in correction mode with the exception of IT stocks. Had it not been for Infosys, the indices would have been down by a considerable margin. ONLY A SHORT TERM CORRECTION. Even if the bearish undertone continues, it will only lead to a correction in the short term timeframe without affecting the medium and long term trends. In that case strong support will be seen near the first correction level of Nifty 5853. So any further dip towards the above mentioned level, will present a buying opportunity in the higher timeframe. Sensex opened the week at 19820, made a high of 19856, low of 19596 and closed the week at 19663. Thus it registered a weekly loss of 121 points. At the same time the Nifty opened the week at 6042, made a high of 6042, low of 5940 and closed the week at 5951. Thus the Nifty went down by 65 points on a weekly basis. Both the indices have formed a black body candle on the weekly charts. Nifty has formed a black body candle such that it forms a Bearish Reversal pattern called Dark Cloud Cover. 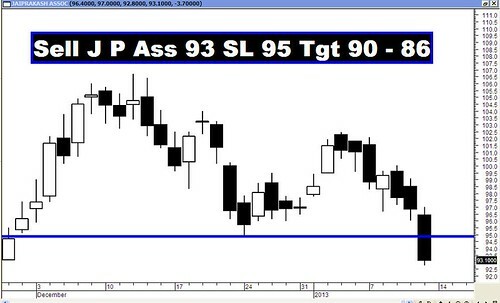 But the Sensex has formed a smaller black body candle which does not close below the mid-point of the previous weeks candle and hence can be classified as a Bullish Continuation pattern on similar lines as Thrusting. Hence we wait for the next weeks candle for confirmation. On the daily charts both the indices have formed black body candle while moving sideways with a negative bias. Currently the indices are undergoing a short term retracement or correction of the previous rise from Sensex 18255 to 19856 and Nifty 5548 to 6042. The correction levels are at 19244–19056-18867 for the Sensex and 5853-5795-5736 for the Nifty. Strong support will be seen at the 38.2% correction level of Sensex 19244 and Nifty 5853 which is near by to the minor intermittent bottom. Hence any dip towards these levels should be treated as a buying opportunity. When the Sensex closed the previous week above 19612 & Nifty above 5965, a Flag formation on the weekly charts got completed. The Flag pole started from a low of Sensex 18255 and Nifty 5548 and the targets as per this formation are Sensex 20969 and Nifty 6382. The targets will be achieved as long as Sensex remains above 19149 and Nifty above 5823. Since the Sensex and Nifty are still way higher, the above mentioned targets are likely to be achieved. The indices are just above the short term average of 20dma (Sensex – 19511 and Nifty – 5931), the medium term average of 50dma (Sensex – 19130 and Nifty – 5817), and long term average of 200dma (Sensex – 17840 and Nifty – 5415). Thus the trend in the short term, medium term and long term timeframes continue to remain bullish. MACD has given a Sell signal this week even while remaining in positive zone. ROC too is positive but continues in Buy mode. The RSI has moved lower and is at 56, indicating that the bullish momentum is not lost entirely. MFI is just above the equilibrium line at 51. Stochastic Oscillator at 60 continues in Sell mode as %K is below %D. ADX has started to move up once again and is currently at 34 indicating that the uptrend is now strong. The Directional Indicators continue in Buy mode as +DI remains above -DI. Meanwhile OBV remains sideways. Bollinger Band continues with its Buy signal given two weeks back. Thus the Oscillators are not giving a clear picture in the short term. The Nifty O.I. PCR is steady at 1.25. Highest Open interest build up for the January series is at 6200 Call and 5700 Put. This suggests that the market expects a trading range for the Nifty with support coming in at 5700 and resistance around 6200 levels. Friday saw strong Call writing at the strike of 6000 indicating a short term resistance at that level. Trendline Support for the Sensex is at 19385. Trendline Resistance for the Sensex is at 19859. Trendline Support for the Nifty is at 5893. Trendline Resistance for the Nifty falls at 6044. For the week ahead, Sensex will find Support at 19396-19137-18862 and will find Resistance at 19856-20045-20238. For the week ahead, Nifty will find Support at 5881-5815-5744 and will find Resistance at 6021-6110-6185.